A microwave oven is dangerous! It emits harmful radiation even when not in use. Steer clear of it at all cost !! Millions of people all over the world ignorantly sacrifice their health for the convenience of microwave ovens. In this modern world, we want things fast. We want quick cooking at the press of a button. From the fridge to the microwave oven and onto the dining table. Voila, dinner is served!! How convenient. But at what cost? Medical bills. It doesn’t pay to be ignorant. If you are concerned enough to want to learn about detox (that’s why you’re here), then stop using a microwave oven! If you surf the internet about microwave oven, you will come across many who say it is safe, and many others who say that it is dangerous. I would rather err on the safe side. My health is much more important than the convenience that microwave ovens provide. I have stopped using a microwave oven for a few years now and saw my health gradually improve with eating all the right things. It really isn’t too difficult to switch from microwave oven cooking to conventional methods of cooking/heating food. Once I understood how harmful microwave oven cooking is, I would not even boil water using it. The small, but well-controlled study showed the significant degeneration of nutrients produced in microwaved foods. The conclusion showed that microwave cooking produced adverse changes in human blood. the same vegetables cooked in the microwave oven. Once the volunteers were isolated, blood samples were taken from every volunteer immediately before eating. Then, blood samples were taken at defined intervals after eating of the above milk or vegetable preparations. Significant changes were discovered in the blood samples from the intervals following the foods cooked in the microwave oven. These changes included a decrease in all hemoglobin and cholesterol values, especially the ratio of HDL (good cholesterol) and LDL (bad cholesterol) values. Lymphocytes (white blood cells) showed a distinct short-term decrease following the intake of microwaved food than after the intake of all the other variants. Each of these indicators pointed to degeneration. Additionally, there was a highly significant association between the amount of microwave energy in the test foods and the luminous power of luminescent bacteria exposed to serum from test persons who ate that food. 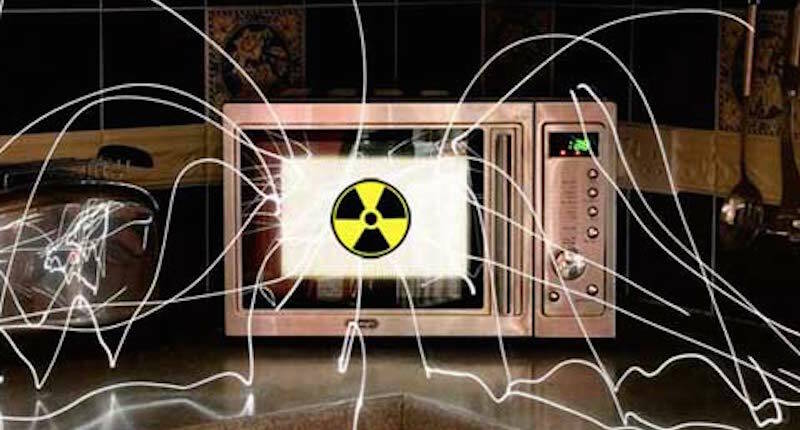 Even when not in use, microwave ovens can emit radiation into the kitchen area. If you own a microwave oven, get rid of it if you want to get well. If it is not removable, unplug it and don’t be tempted to use it under any circumstances! Take two small pots of healthy plants—mark one “Filtered Water” and the other one “Microwaved Water”. Boil some water using a microwave oven and let it cool. Use this water to water the pot of plant marked with “Microwaved Water” and the other with your normal drinking water. At the end of about ten days, you will see that the plant watered with microwaved water would have wilted; whereas the other plant would still be healthy as it should be. This test will show you how the molecules of water had been altered so severely that even plants are not able to absorb it. 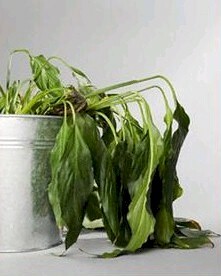 Do you want to wilt like this plant? Read more about the dangers of electromagnetic fields and smart meters.